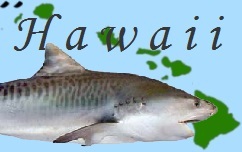 A 27 year old Kapaau man was spearfishing Sunday afternoon about 60 yards off Upolu Point in North Kohala, when he reports a 13-foot-long tiger shark bit him on his left leg. He was able to swim to shore and alerted his fishing companion, who then called 911. An ambulance took him to Kamehameha Park and then he was flown by a Hawaii County Fire Dept. helicopter to North Hawaii Hospital and taken into surgery. No beaches are closed,since this occurred in an isolated and remote area. Water conditions were murky due to heavy rain in the area. The Dept. of Land and Natural Resources advises people to avoid entering the ocean during brown water conditions.